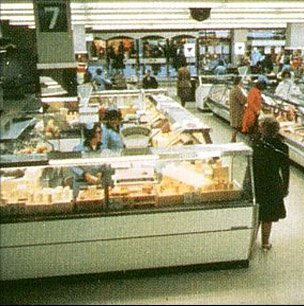 Woolworth had embraced food in the 1960s, adding supermarket sections to stores as they were modernised, and experimenting with greengrocery, butchery and even fresh fish. 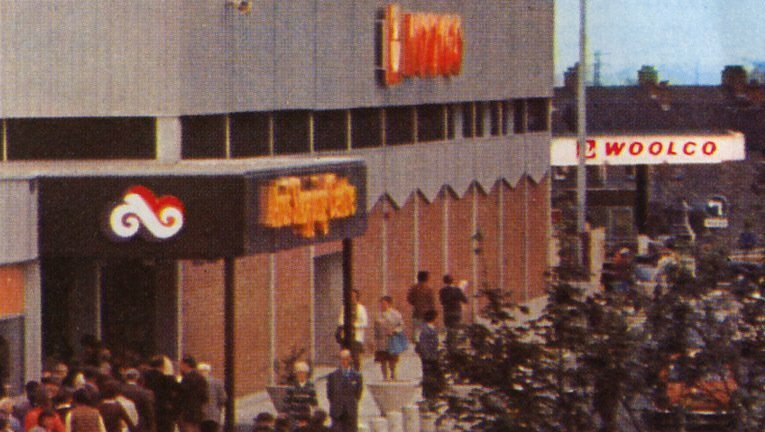 In the Seventies it hit on a winning formula by updating the styling of its out-of-town Woolco Division as a hypermarket instead of a department store. Sales rocketed. But it proved harder to replicate the success in the High Street. 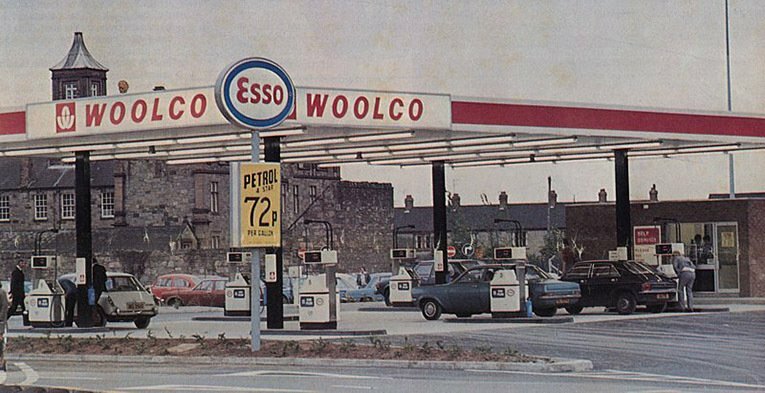 Woolworth UK had opened its first Woolco in Oadby, Leicester in 1967. Its design aped the first stateside branch in Columbus, Ohio, which had opened in 1963. In North America Woolco was considered an act of faith. By 1970 there were over 100 branches. The Boards on both sides of the pond had been amazed by how quickly British shoppers had embraced the concept, generating a higher profit. Executives in London were encouraged to refine the formula in future stores. A task force was established. It reviewed the latest retail theory, identifying high potential from reshaping Woolco as a hypermarket rather than a Department Store. HQ in New York gave their blessing as middle managers Hugh Jones and Mike Morris were given their heads to put the theory into practice in a new-build store already planned for the Ards Centre in County Down, Northern Ireland. Gangways were widened. The floor was filled with a smaller number of taller island counters stretching seven feet (2.4m) tall instead of four (1.4m). Commissionaires gave shoppers trolleys rather than traditional hand baskets as they entered, while the new store enticed people to travel from further afield with the lure of a 15% discount on fuel at the filling station. 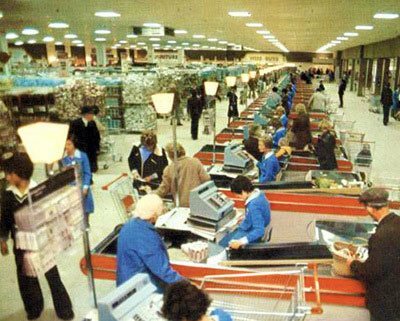 The store was a first, setting many of the standards commonly used by the major supermarkets today. It looked clean and modern, while its sales were off-the-clock. From the first day it rocketed straight to the top of league table, outperforming every other store in the British and Irish chain. The decision to open in Ulster was both brave and imaginative. Political instability and the threat of terrorist attacks in "the troubles" had discouraged retailers from investing in the Province. But people still needed to eat and shop, leaving a gap in the market. Woolworth had originally planned a traditional store for the location. The late changes sparked interest and speculation across the Irish Press. The opening drew huge crowds. An orderly queue formed as shoppers waited patiently for the Royal Ulster Constabulary and British Army to pat them down before allowing them inside. Ulstermen and women had become reconciled to such precautions. When they finally got inside they were still in the mood to spend. Many were dumbfounded by the sheer scale of the shop's huge displays and its bright lighting, exclaiming that it was unlike anywhere they had shopped before. Half of the space was given to groceries. 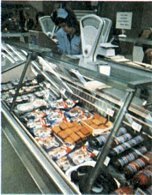 There were aisles of canned and packet goods, and banks of freezers crammed with Birds Eye products, complemented by specialist counters which were like the shops in a traditional High Street. There was a bakery with fresh bread and cakes, a delicatessen with cheeses, bacon, and cut meats, a butchery, and even a fishmonger. All were staffed by specialists who were keen to share their expertise. The other half of the store had a full selection of items for the home, garden and family. These included upscale displays of fashions for all ages and tastes, furniture and homewares, electrical appliances and audio-visual ranges as well as sports and leisure goods. 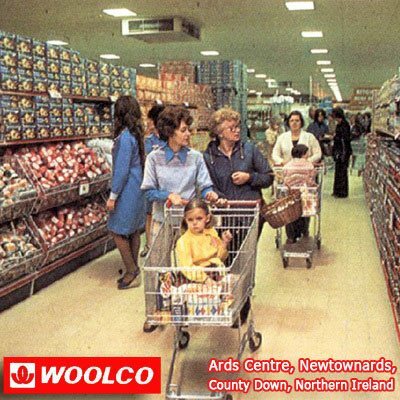 The store also stocked the full Woolworth range from pic'n'mix to DIY, gardening, toys and toiletries. As the weeks went by it became clear that this was no flash-in-the-pan. The weekly sales of £145,000 in Newtownards rivalled the combined sales of the flagship stores in Henry Street, Dublin (£63k), High Street Belfast (£70k) and Ferryquay Gate in Londonderry (£20k). Its gross margin was lower, but still a respectable 22.5%, while its weekly salary bill of £10.5k was the lowest as a proportion of sales worldwide, despite a workforce of over 200 people. Jones and Morris had found a winning formula. Jones was tasked with planning mainland versions in Maidenhead, Berkshire and Nottingham, while Morris was given a yet tougher challenge. He was given control of the Woolworth Metropolitan Region, and asked to deliver the same step change in results across the London flagship stores and the 250 branches across South East England. 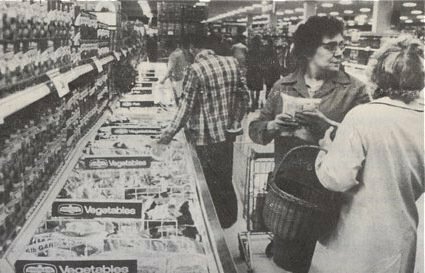 The bold steps in the Woolco hypermarket were in marked contrast to the main Woolworth chain's confused offer of groceries and food during the 1970s. Executives faced an uphill battle to persuade the American owners of the merits of selling such a low margin range. The 1960s move to introduce fresh fruit and vegetables was reversed in favour of a more restricted offer. 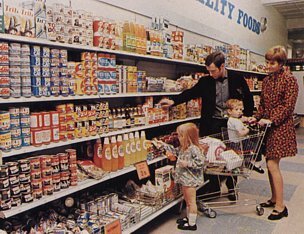 Every store would stock a compact range of tinned and packet groceries, along with biscuits, cakes, pet food and soap powders, supplemented in the major city and suburban stores by delicatessen counters, offering meats and cheese cut to order and sold by weight. It is quite common for shops to offer a small convenience grocery range alongside other products today. But at the time the concept was quite novel. Managers had to find space in the middle section of their stores, midway between the entrance and the back wall. This was intended to draw customers from the fast selling sweets, toiletries and records inside the entrance towards the higher margin ranges of homewares and fashions at the back. Some stores, like Pinner, Middlesex (left) found good locations. But many couldn't create a "shop within a shop" displaying food adjacent to gardening or DIY. This added to a growing perception that Woolworth had become a 'jack-of-all-trades'. For example, despite a full refit, the food offer in Southend-on-Sea (below) appears lost in a sea of general merchandise. Own brand foods were competitively priced and were the big sellers. Budget biscuits had first appeared in 1920, while sixpenny tins of fruit were a comparative newcomer from 1937! Many of the new supplier branded lines, like 2lb (0.9kg) Tate and Lyle Sugar bags, and 4oz (125g) packs of PG Tips Tea, were heavily discounted as a response to the emerging threat of discounters like KwikSave and Victor Value. Woolworth chose to invest heavily to introduce delicatessen counters, as they required hygienic preparation and chilled storage facilities behind the scenes. History shows that the return on the outlay was low, and, like greengrocery, the initiative was short-lived. 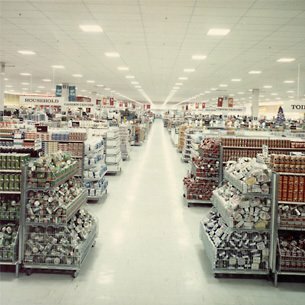 The best-performing High Street stores were those able to devote a floor to groceries, or create a distinct supermarket section. By the 1980s such spaces were deemed an extravagance as the largest stores were closed and sold, or reduced in size. Only the business model at Newtownards showed real potential, but, before the first brick could be laid in Maidenhead or Nottingham the goalposts had moved, after new Executives took the helm in a management buy-in.